One of our quick go-to meals is chicken taco soup. It's fresh, hearty and comes together pretty quickly. Plus, it's toddler-approved! The recipe is simple and can easily be modified to be whole30 approved. There is one secret ingredient though, and it makes a difference... lime vitality essential oil!! If you don't have an lime EO you can use some lime zest and lime juice to get a pretty similar flavor. Add olive oil + onions to a dutch oven or large pot and cook over medium heat until translucent. Add carrots + sweet potatoes (if using), cover and steam sauté for about 5 minutes to soften the carrots. Add zucchini, bell pepper, cooked chicken, seasoning and broth and simmer for about 15 minutes. Stir well to combine all the ingredients and add more seasoning if you choose. Add lime essential oil (or a healthy squeeze of lime juice + some zest), stir one last time and remove from heat. Alternatively, you can add a little lime oil or juice to individual bowls. Top with homemade guacamole or sliced avocado and fresh cilantro! *To make with raw chicken, simply add diced chicken in with the onions and carrots and cook until no longer pink. I typically bake my chicken while I'm cutting up veggies (350 for about 25 minutes for 2lb), or I will cook it in the Instantpot during the day. 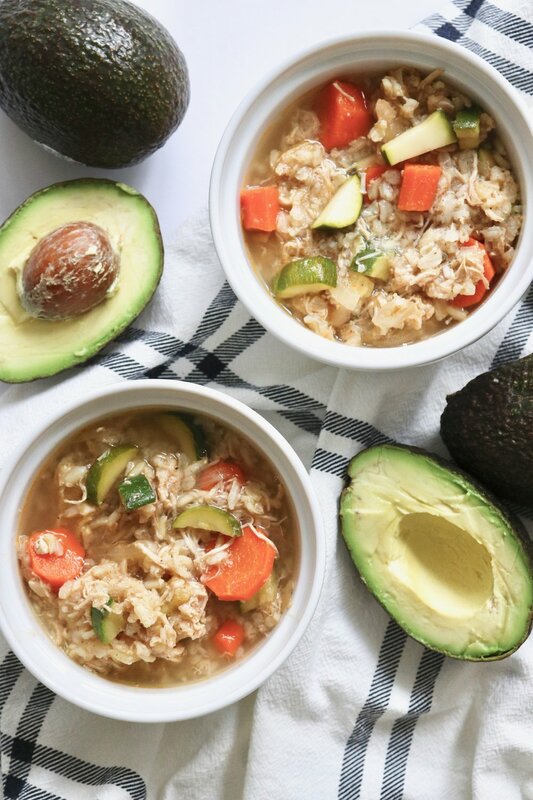 **To make in a slow cooker or Instantpot, add all ingredients except zucchini and lime oil to the slow cooker and set on low for about an hour (2-3 if using raw chicken). Add in the zucchini for the last fifteen minutes! Melt ghee to a pan over medium heat, then add riced cauliflower. Sauté for about 5-10 minutes until softened but not completely cooked. Remove from heat and stir in lime oil, cilantro and a little extra ghee for good measure!